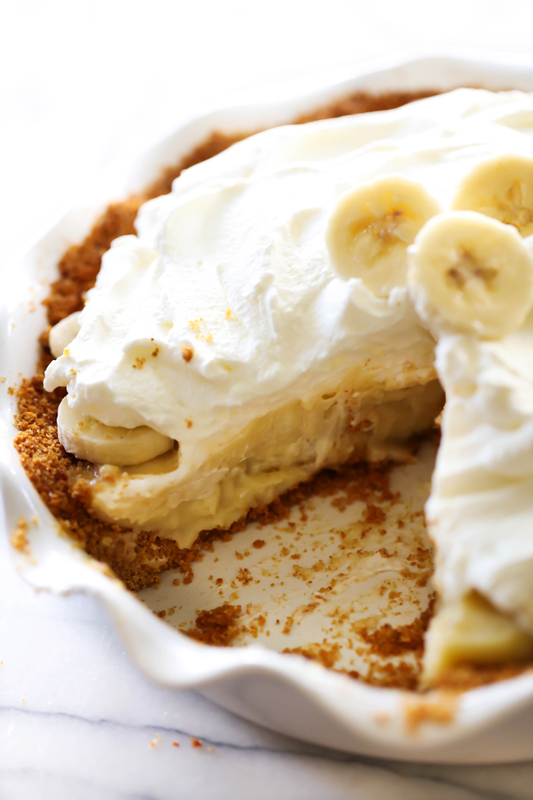 This Best Ever Banana Cream Pie is truly INCREDIBLE! It has a homemade graham cracker crust, delicious banana cream filling and topped with whipped cream. It is perfect for any occasion! You guys. This pie is insanely delicious. I am not normally a pie person but this one has quickly soared to one of my new go-to desserts for company. EVERYONE raves about this pie! 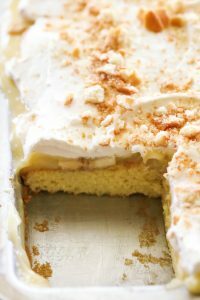 It starts with a homemade buttery graham cracker crust that is such a wonderful accent to the the banana cream pie filling. But let’s talk about that cream filling though… The banana cream pie filling is of course the best part of this dessert! It is silky, creamy with delicious chunks of banana throughout. It is then topped with a homemade whipped cream that truly completes the pie. The three parts of the pie work together to create magic in every bite. 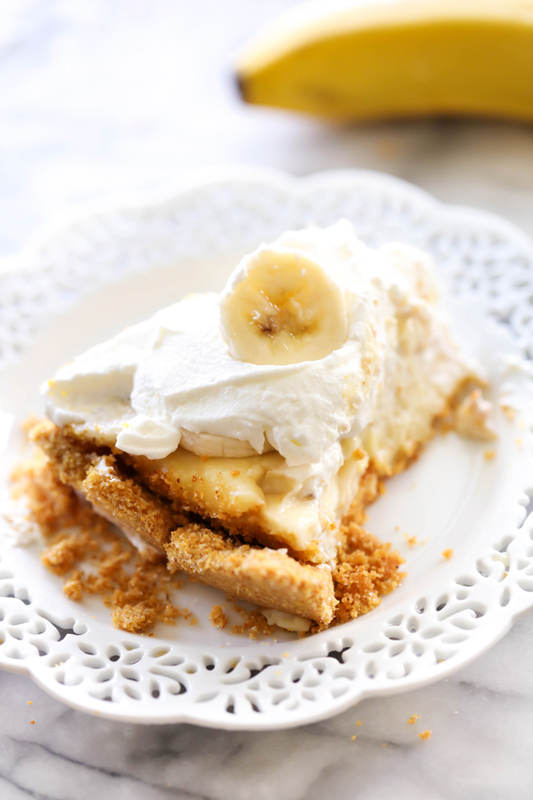 I kid you not when I say that this pie will be THE BEST Banana Cream Pie you EVER try! In medium sauce pan, combine sugar and cornstarch. Add half and half and egg yolks and whisk until well combined. Bring to boil over medium heat, stirring constantly. Boil 1 minute and remove from heat. Stir in butter, and vanilla. Pour ½ of the filling into the crust. Top with sliced bananas to cover the filling. Pour the rest of the filling over the bananas. Cover with saran wrap directly on the filling itself to avoiding a sticky film on top. Top with another layer of sliced bananas. In a medium mixing bow,l beat whipping cream at high speed. Gradually add sugar and vanilla. Beat until stiff peaks form. You don't want them to be soft but you don't want them to become butter either. Spread whipping cream over the top of the bananas and then garnish with a few more slices of bananas. Serve. I'm not sure how helpful this response will be, but half and half is basically equal parts milk and cream. I used this recipe for Thanksgiving yesterday. I've never made a cream pie from scratch before, so i was nervous. It turned out perfect! Thanks for sharing. This was a huge hit for my mother in laws birthday! Requested that I make it again for Christmas dinner. Thank you so much! Followed it step by step, just perfect! 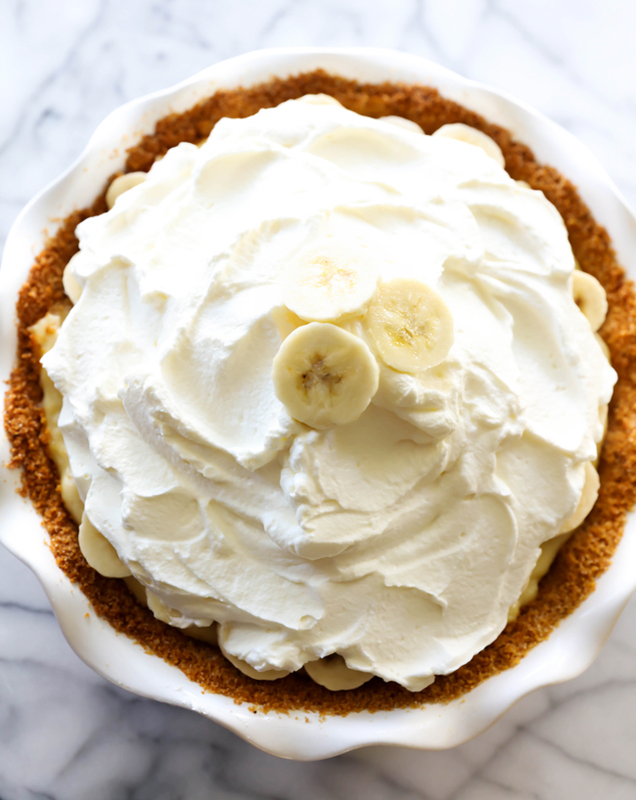 I made this the way the recipe is given and holy moly it's absolutely the best banana cream pie ever! Unfortunately my husband is lacoste intolerant so I had to remake it so he could eat it. For the cream filling I used 2% Lactaid milk instead of the half and half. So far it tastes delicious. Will know more once it sits for a while. I also took the sugar out of the graham cracker crust to cut back on the sugar but did use honey graham crackers. Haven't figured out the whipped cream though. Thank you sooo much for giving me an awesome banana cream pie recipe!!! I also added a smashed up banana to the cream while it was still hot to give the cream a banana flavor. Just made this for Pi Day. Loved it! It was my first cream pie and I was very pleased with how it came out. This really is the best banana cream pie ever. Thank you for the recipe. I made it last night and my husband loves it and so do I. THE BEST!!! Followed the recipe except I didn't make the homemade topping. I used ready whip so I could add the topping when serving since the whole pie wasn't going to be eaten at once. I also found a tip for keeping the bananas from turning brown, without using lemon juice. Use bananas that aren't super ripe (just a bit green on the stalk). Slice them longways (in half) and put cut side down in the pie shell. Mine took 3 bananas and I had to piece in some, but the bananas did not turn brown. Every banana cream pie I have seen slices the bananas horizontally, and the more cuts, the more brown the bananas get. 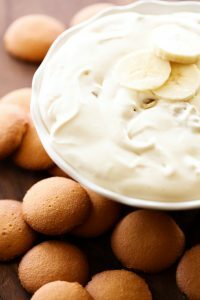 Going to use this technique for banana pudding next time I make it. It is found in the dairy next to the milks. It is a blend of half cream half milk. I was so excited to try this recipe, and it was nothing but a liquid mess! You may want to alter your recipe a bit or rename it because it is definitely not the best. I am not an experienced pie maker and this recipe was SO simple and SO DELICIOUS! My entire family loved it and it was a HUGE hit. 12/10 would I recommend this recipe to anyone and everyone! If I had to guess....you didn't boil the filling long enough. Bummer. Made your recipe with my 7 year old son for my grandmothers 93rd birthday. Very easy to make and your directions were very clear. It was light and delicious as well! Thank you! Great recipe! Your directions were simple and clear. Thank you so much! My son loves banana and requested pie for his birthday. We all loved it! I subbed Oreos for the crust too and sprinkled some crumbs on top. This absolutely is the best and easiest recipe I have tried on Pinterest. I had plans to make this myself but wasn't feeling well. Soo my 18 year old daughter and daughter in law stepped in and made the pie. I never saw a slice it was eaten so fast. I came home today and she made another so that I could indulge. I ingredients are few and it was so easy. I don't know how the other geniuses that gave you less than 5 ⭐'s ended up with a soupy mess lol. The recipe does call for cornstarch and eggs. GOOD LORD. ANY WHO..... THIS WILL BE MADE OVER AND OVER AGAIN IN MY HOUSEHOLD. THANK YOU. This recipe worked perfectly and scored big points with the banana cream pie lover in my life. Thanks very much! A five star for sure! I make it every year for my dads birthday. Thank you!! The first pie I made was an epic fail, but after reading the comments I realized I didn't boil the filling long enough. The second pie I made was AAMMMMAAZING!! We let it set for 3 hours, and it was good, but it was even better the next day! First time making a pie that wasn't pumpkin. It tasted wonderful and looked beautiful! Love this recipe! Thank you!!! Turned out amazing. I didn’t layer bananas though I just mixed them in. Thank you for the recipe! Should I use unsalted butter?